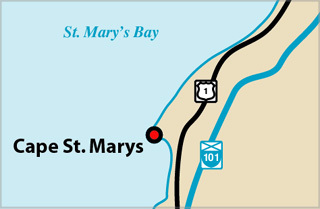 For local tourist information, go to Cape-Saint-Mary-Lighthouse-Park . Structure Type: Square concrete tower, white, on fog signal building. This may actually be the thrd lighthouse on this station. Structure Type: Tapered octagonal wood tower, white, red lantern,possibly replaced first lighthouse by 1922. Light Height: 103ft feet above water level.